trackscotland.co.uk :: View topic - Sequential Gear Change Actuator - Not Pneumatic! Mon Dec 05, 2016 6:19 pm Post subject: Sequential Gear Change Actuator - Not Pneumatic! I thought some of the members on this forum would like to see a video of a car we've been working on at Track Formula. Instead of a pneumatic or hydraulic gear change system this car uses one that's electronic and controlled by the ECU. 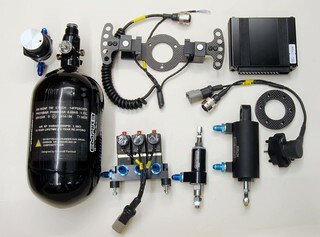 The paddles used transmit their signal wirelessly to the receiver which outputs to the ECU and it commands the actuator. 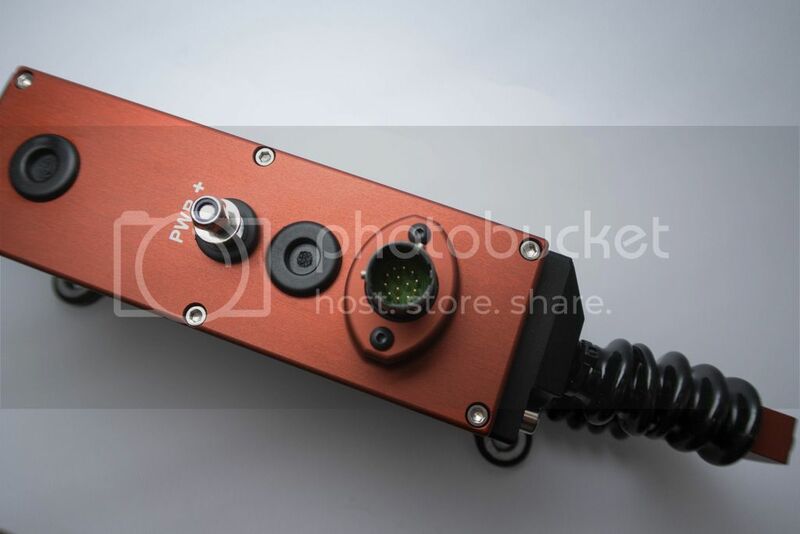 This wireless system allows the driver to detach the steering wheel in a race scenario with no curly cord and it will still operate from 6m away. The wireless system is endlessly configurable by the user via USB to choose between momentary or latching for the switches on his 8 channel unit. It also has a unique ID so it does not interfere with other users units. 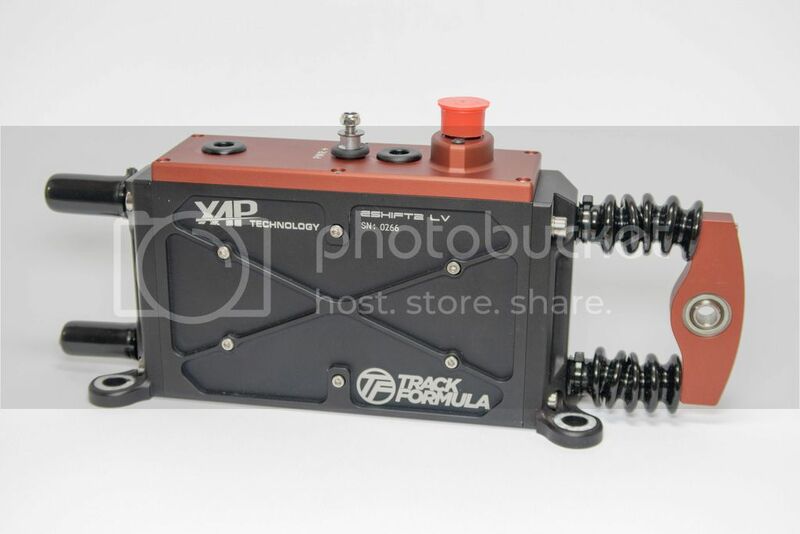 There are many advantages with this electronic actuator as the data logging shows that the shift time is repeatable and consistent throughout back to back lapping. The driver can also choose an assist mode where once a set value 'X' has been detected, the ECU will command the unit to take over the shift. In doing so it prevents the driver from incorrectly pulling or pushing the lever causing a poor gear change. Some drivers want paddles for racing but to retain the lever for the feel of being connected to the car - here it is! Nothing needs to be detached or adjusted in order for the driver to use the lever and there is little to no added resistance on the push/pull feel of the lever overall. This video was pieced together from various videos of various people involved while being engineered to fit and work with this car. The mounting solution for this unit will be available off the shelf for the Evo 5 chassis and Samsonas gear lever. 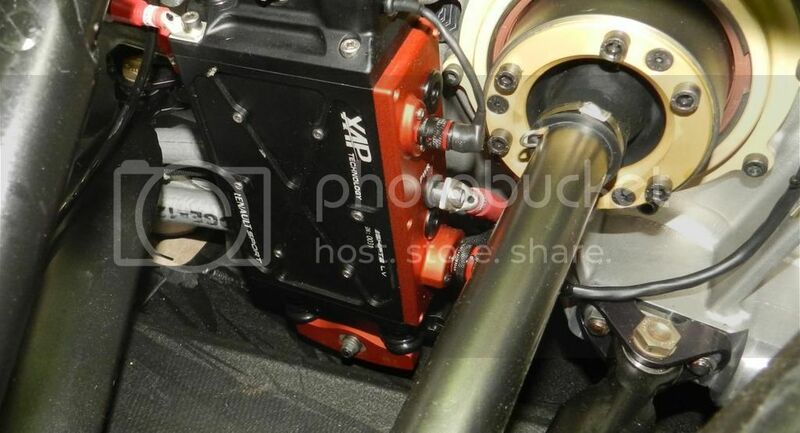 We are currently working on an Evo 8 that uses the Quaife lever in order to provide an off the shelf mounting solution. By mounting solution we mean the base plate for the unit which will bolt to existing mounts in the chassis and a lever mount that will attach easily. 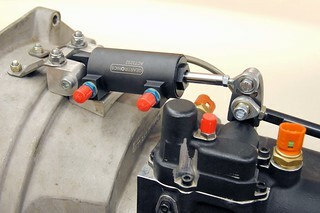 There are actuators that are designed to be 'box or chassis mounted. I've just fitted a Geartronics pneumatic system, so read your post with interest. I know there's a bit of history with Geartronic's marketing and claiming how superior pneumatic systems are. Personally I don't think the source of motive power is particularly important, as long as it works. But, by way of constructive input, the video shows a system that would just be too bulky for my own installation. It's very difficult to do better than a small, light, self adjusting, reliable and powerful pneumatic actuator (powered in my case with light weight carbon 300 bar air bottle). But the installation did teach me that real heart of any system is the software and strategies employed. Here's mine showing how the installation is effectively invisible in the small confines of the Caterham. and being driven properly . . .
What you see in the video is an installation with the criteria of retaining the Samsonas lever and adding paddle control. The plan from the outset was to add on to what the customer had and if so, for it all to be removed with no holes or marks to be found hence there is the mounting plate further back from the bulkhead to pickup on OEM mounts. Hydraulic, Pneumatic or Electric may have Pros and Cons for each application. However, we have found this one to be most appealing to the masses. Your installation requires multiple components which adds to increase risk of failure. 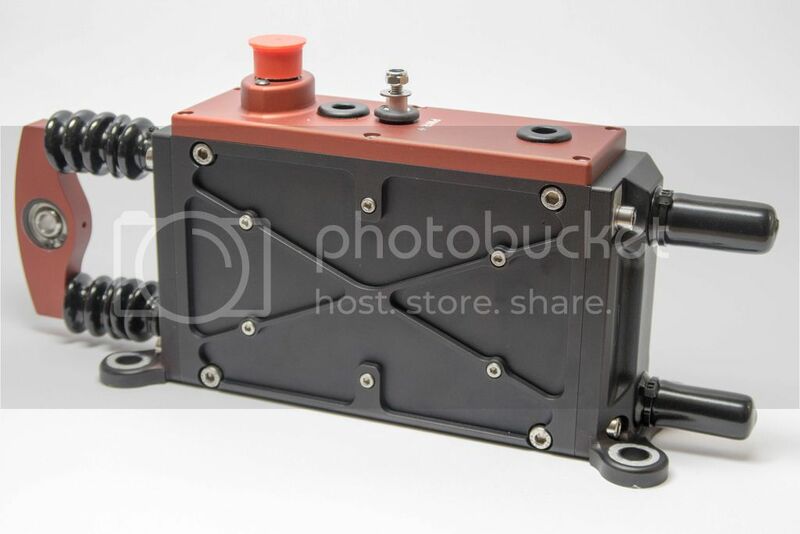 If you were to choose the 'box/chassis mount solution of this unit then you would only need what is effectively on your car the 'box actuator, power feed and some signal cables. It can be installed as compact as below when you specify your needs such as having a car as yourself. This unit has spherical joints on each end to allow the unit to move through it's throw pattern and not cause any flex/stress to any other components. I'm sure you would feel better opening this up in a box and realising that's all you needed to fit as opposed to the multiple items in the Geartronics kit. I'm not sure I buy the reliability argument. If your system is switching 100 amps with every gear change, then the electrical system needs to be in pretty good condition. Batteries, alternator, and wiring will all be taking quite a hit (I say that as an electronic engineer). It's all very well to water it down by averaging it over 2 seconds, but a 100 amps at 12 volts is a 1.2 KW kick coming from somewhere. As said earlier, if it works, that fine, but it's a very long way from opening a poppet valve and delivering all that energy from an independent compressed air source. The Geartronics can be quite simple in terms of the number of parts. This is what went into mine, which also includes a dual barrel sensor (redundancy) for closed loop functionality, and a blipper for clutch-less down-shifts on my somewhat primitive mechanical throttle bodies. There is no question about Geartonics being reliable. When mentioning increase in risk I would say that there is more room for installation and setup error, especially with so many components. Not all users are as capable as yourself. When installed and setup correctly then yes the kits works as is well proven there is no denying. However, I'm sure you could say you have had maybe one or two issues with the kit? This would be a guess but only based on my current knowledge of their system. I would be interested to know if you are 100% happy with the installation, setup and how reliable the system is. Has it changed gear 100% of the time? I'm only picking up on this due to you having to highlight a video of when it works. As you're an electronics engineer you should have read that it's 100A peak. This is not drawn every shift and can be run reliably and repeatable from small lithium or gel type batteries. There isn't even a full 1volt drawn from the sytem for a total engage and disengage of the unit from memory. The 100A did stick out to me when I was first reading the specification but as I've highlighted it's a peak draw. What happens with your race when your system has a failure? Do you still have your lever attached and can take over with a manual shift? How much pressue do you have to store in your accumulator and how often does it last? Do you see the pressurised storage being a safety concern at any point? Your picture does not show the compressor or the pneumatic lines and by the looks of it some wiring. How do you charge your tank and how long does it take? Do you have to carry extra equipment with you to maintain the system on a race day? Can your system switch to a low power mode to select 1st or reverse to prevent dog to dog wear or failure to engage when stationary? This all comes after the cost of Geartronics kit which isn't shy. Their kit once spec'd is a large chunk of hard earned money as you will know. I don't say the above to be difficult or cause any personal issues, i just like to highlight things like this. Mainly due to the fact I will be biased with the electric system but I like to discuss this sort of thing and I can accept all forms of feedback and I also enjoy technical discussions that others can benefit from on an open forum. The system is fitted into Colin Dorwards Evo and also Russ Patons Evo so the next time you're near them please come over and have a chat and look over the unit as this is what the likes of this forum is about. I don't want to hijack your thread and turn it into a Geartronics promotion, but I think your last post needs a response. My paddle shift wasn't that tricky to install and worked well from the very first test (on default settings) - in fact, after testing, we returned to the default setting as that's what worked the smoothest. It is in the very nature of sequential gearbox design that there's a statistical chance of shift failure, i.e. the dogs clash and bounce the barrel back. It is how the system deals with those circumstances that really matters. This season, I have logged a handful of 'shift failures' but the closed loop has resolved it within milliseconds and the driver is normally totally unaware. I can recall only one shift that timed out. Driving the car using the gear stick just confirms how clever the Geartronics paddle shift is, and servicing also shows much less debris within the gearbox. In terms of reliability, the blipper did ingest some water and was relocated to avoid a repeat of that, but otherwise I can't think of any other problems that could be attributed to the paddle shift. I was reluctant to post this video as I thought it was a little unfair in your thread, but here's Rory Butcher making comments on the the paddle shift (at 1.45 mins into the video). He drove the car without any prior brief and did not know what system was installed. From cold, and left foot braking, he was up to speed in three laps. As a side issue, he is seen selecting a down shift at Clarks, which is declined, due to being too near the limiter. It's ok, i have no issue with your posts and this discussion. It's just technical chat and personal experience with systems like this. It's an open forum so please do not be concerned about discussing what knowledge you have and what experience you have with a product. The electric actuator is IP68 rated so would never fail if it was submerged in water let alone sprayed like your blipper issue. Of course the actuator is not a blipper but just highlighting. I'm glad you are happy with the cost and installtion of your system as well as how it has operated for your needs. However, you never answered most of the questions i asked about your system. The bottle is charged to 300 BAR and lasts around 500 shifts. That's about the same as a full tank of petrol so the bottle is recharged from a standard air bottle which takes less than a minute. There is no on-board compressor. If it runs out, you get about 10 shift of reduced performance (slower) - enough to get back to the pits. I started the season with the gear stick but took it off (to save weight) when it proved to be 100% reliable. There is a 'limp home' switch that is an open loop mode in case of barrel position sensor failure. Reverse/Neutral/1st on the Sadev is a half shift and there is an interlock button (or clutch switch) to prevent accidental selection. It is very clever in that you can go from reverse to 1st and avoid neutral by use/non use of the button - works very well. No, it's not cheap, but you get what you pay for and I felt the whole process, from concept through to completion of the project, was worth the cost - cheaper than the exhaust on the car for example. Excellent David, i appreciate you taking the time to answer the questions. I do not doubt the Geartronics kit but I see more benefits in this electronic system hence me taking it on. Your car and system appear to run very well and it's also good to hear that the driver is also the mechanic with such technically capable system fitted. The Sadev skipping neutral is a very good idea and something that I did not know about so thank you for telling me. I wish you all the best for your 2017 racing season. The bottle is charged to 300 BAR and lasts around 500 shifts. That about the same as a full tank of petrol so the bottle is recharged from a standard air bottle which takes less than a minute. There is no on-board compressor. Reverse/Neutral/1st on the Sadev is a half shift and there is an interlock button (or clutch switch) to prevent accidental selection. It is very cleaver in that you can go from reverse to 1st and avoid neutral by use/non use of the button - works very well. I have been looking at paddle shift options so always keen to see what is what. Interesting debate, and I have learned things so that's always good! Post up the details when the kits finished, although my own car is s K20 motsoport exige with quaife sequantial so I really do not know if there are off the shelf options as such.. The kit for the Evo 5 is finished. We're working on the Evo 7,8,9 chassis and the Quaife lever for the Evo just now. We can cater for any application as we have CNC machining capabilities in-house. Here is another video that shows it working in-car. Also, remember that there the paddle signal is wireless so Colin's steering wheel can come off and leave no cables.